December 28, 2012. We spent the evening entertaining guests at the beautiful Gateway Lodge in Cook Forest. The restaurant is known for its extensive wine list so we followed the sommelier's lead and carefully selected music with diners' delicate palates in mind. Our two-hour set was mellow yet expressive and included a variety of homebrews along with several songs that had aged for years. We gave those a chance to breathe, of course. December 8, 2012. Jenna Juredine, proprietor of the Barking Spider Tavern in Cleveland, gave us two gifts at the top of our wish list tonight: a listening audience and stellar acoustics. The room was packed, thanks to the venue's popularity and several plugs by Steve Traina during his Steve's Folk Radio Show on WCSB 89.3 FM this morning. The lively crowd included an extended family of Pittsburgh expatriates now living in Cleveland, and a man who had just returned from a pilgrimage to Jerry's Records in Squirrel Hill. After performing for 90 minutes straight, we had the great pleasure of chatting with some of the folks who had been tapping their toes while sipping their drinks. What a night! We're looking forward to returning in 2013. November 28, 2012. We're still riding the sound waves from last night's variety show at the ButterJoint, the bar attached to the upscale Legume restaurant in Oakland. As the house band, we played four sets over the course of the evening for a lively crowd that included several musician friends of ours. The show featured performances by two other Pittsburgh-based co-ed duos — Broken Fences and State College — and a couple of standup comedians. November 19, 2012. We had a blast at the AcoustiCafe open mic at Club Cafe tonight! Our friends — Emily Pinkerton, Judith Avers, and Ellen Gozion (AKA The Early Mays) — hosted and the theme was "cover each other" so we played "Beautiful Dress," track 3 off Emily's most recent CD, Ends of the Earth. November 17, 2012. We provided live music for the 40th anniversary celebration of the Carnegie Library of Pittsburgh's Squirrel Hill branch today. After our hour-long set, branch manager Holly McCullough asked for a copy of our CD for the library's circulating music collection. We felt awfully proud handing it over. Now when folks want to "check us out" we know where to send them. November 3, 2012. We performed at a house concert last week, sharing the bill with Texas-based singer-songwriter, Ken Gaines. The environmentally-friendly home of our inspired hosts, Maren and Neil, was the perfect setting for Organic Chemistry, our pasture-fed, free-range love song dedicated to folks with solar panels on the roof. October 10, 2012. We got our first two CD reviews! Andy Mulkerin, music editor for Pittsburgh City Paper, describes our music as "well-played... nicely crafted and cute," and Scott Mervis of the Pittsburgh Post-Gazette refers to our "earnest lyrics, gentle harmonies, and delicate acoustic musicianship." September 29, 2012. 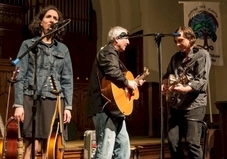 Two years ago, we met Joe Crookston at SongSpace at First Unitarian, an intimate venue where local, regional and national musicians have the opportunity to connect with people who really appreciate folk, old-time, bluegrass, singer-songwriter, and world music. Tonight, Joe returned for another inspiring performance, and we had the incredible honor and privilege of opening for him. The beauty of the sanctuary, the awesome acoustics, and the enthusiasm coming from the audience made for quite the experience and when Joe joined us for our last song, we couldn't contain our delight, even though we were singing the blues. September 23, 2012. There were three cool things about our outdoor performance at the East End Food Co-Op's Art Harvest Street Festival today: 1) The temperature. Yikes! 2) The solar panels. The sound system was powered entirely by the sun! 3) The other bands. Sharing the bill with young, groovy hipsters warmed our hoary hearts. September 22, 2012. Rather than have us perform in the studio this morning, the Saturday Light Brigade team set us up outside in front of a live audience at the Pittsburgh Mini-Maker Faire. High winds took out a couple of tents and the power failed once or twice but we just held our instruments extra tight and everything was fine. Chatting with Larry Berger, the host of the popular public radio show, is always a treat. September 16, 2012. Our CD release party was so much fun! Barefoot and surrounded by smiling faces, we were in our element. We'd like to extend a heartfelt thanks to the many folks who showed up to celebrate with us, and to our Kickstarter backers who helped fund the project. Our CD is now available in Pittsburgh at Acoustic Music Works and online at CD Baby. September 9, 2012. We were the featured performers today at the Carnegie Library's Sunday Afternoon Music Series, a monthly program that transforms the exquisitely renovated first floor of the main branch into a concert hall. No "shushing" here – during the sound check, the librarian actually suggested we turn up the volume! Our audience was very receptive and a few folks took home advance copies of our brand new CD. Gary got a kick out of swiping credit cards with the Square card reader that attaches to his phone. July 13, 2012. Today's gig under the big tent in Schenley Plaza was awfully fun. The weather cooperated and we had a very nice crowd, including a group of high school students from the Young Writer's Institute at Pitt. About half way through our 60-minute set we decided to try out our new arrangement of "Carny." It sounds creepier — in a good way — with Gary singing lead. July 4, 2012. We took to the streets tonight, busking for 90 minutes in a grove on Mount Washington, overlooking Pittsburgh’s glorious skyline. Roadblocks forced us to park ½ mile away, so we left Gary’s PA in the car and performed without amplification. Idling cars and boisterous groups of revelers were a challenge but we managed to get through our set without breaking any strings or vocal cords. For an encore, the city provided a spectacular fireworks display. June 11, 2012. We got a plug in a CBS article about busking! "If a quirky mix of acoustic folk, blues and country music is what you’re looking for, don’t miss the Squirrel Hillbillies from the city’s East End. The duo frequently performs sets debuting original songs at the Pittsburgh Public Market, a venue that feels like home to them." June 8, 2012. We spent an hour in Schenley Plaza on Friday afternoon, performing for a hearty lunch time crowd. It felt good to be back outside after all the studio time we've had lately. CDs are way higher maintenance, it turns out, than live audiences. May 16-20, 2012. We performed five days in a row at the Pittsburgh International Children's Festival, under an airy tent in front of the main branch of the Carnegie Library. 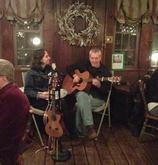 Our family-friendly set included a debut of our stinkbug song which features bass uke, a new instrument for us. Getting the audience to buzz on command... that was really cool. May 7, 2012. We returned to the Children's Institute of Pittsburgh this morning to perform for some amazing kids who attend school there. Despite significant challenges, many responded to our music, which was moving for us. And as always, their dedicated teachers were a source of inspiration, too. May 2, 2012. We are grateful for the outpouring of support from family, friends, and other backers helping us to produce our debut CD. We have already recorded many of the tracks and will be meeting with a sound engineer next week to discuss the mixing process. April 2, 2012. We just launched a Kickstarter campaign to help us produce our debut CD of all original songs! February 26, 2012. We performed at the Pittsburgh Public Market's First Annual Wedding Weekend today, an event featuring guest merchants (e.g., Dawn Biery, a photographer, who took some nice shots during our set) along with the regular vendors who come to sell their goodies each week. A few friends stopped by, which made the afternoon extra special for us. We'll be back at the market for another performance Sunday, March 25. January 29, 2012. We traded the Sycamores and Oaks of Pittsburgh's urban forest for the Hemlocks and Pines of Cook Forest this weekend, heading 100 miles northeast to the Gateway Lodge, near the Clarion River. The Great Room, with its log burning fireplace, enormous windows, and cathedral ceiling, was a spectacular place to perform for guests, many of whom were "yinzers" like us. Jody Fesco and the rest of the staff took good care of us. We're looking forward to returning, possibly to play some music around the campfire this summer. January 22, 2012. Our Waffle Shop gig was a hoot, start to finish. When we arrived, another live streamed broadcast was in full swing, with two young men belting out a medley of rock classics next to a life-sized mannequin bedecked with curiosities. Chef Tom Totin, host of "Cookspeak," helped us unload our equipment while filling us in on what to expect during his show, which he's been producing for several years. As soon as the stage was cleared and the mics and video cameras tested, the crew gave us the "on air" signal and we started chatting about our musical influences, approaches to songwriting, and favorite foods (it's a cooking-themed show, after all). Tom left plenty of time for music, so we played several songs, all originals, and took great pleasure in the positive response from the audience, which was full of plants. After the show, we bought some Venezuelan arepas from the Conflict Kitchen, next door. Both eateries, run by artists, serve up a quirky unconventionality that tastes real' good to urban hillbillies, like us. You can watch the entire show online at www.ustream.tv/recorded/19939838. The music starts around 14:40. January 20, 2012. We performed today at the Zone Cafe, a Lawrenceville eating establishment and gift shop operated by the Boys & Girls Club of Western PA and staffed by students from the Career Connections Charter School who prepare food, stock shelves, run the cash register, and perform other duties to gain work experience. Our 60-minute set included a debut of "Joe and Donna," an original love song set in the 'Burgh with plenty of references for locals to enjoy. January 15, 2012. We had a great audience at the Pittsburgh Public Market today. Our set included the debut of "Organic Chemistry," another quirky original that features a blues shuffle on uke, whimsical flourishes on guitar, and references to yoga, herbal supplements, honey bees, and composting. It was a bit raw but we figured that was OK given its thematic content. We were so happy to be back at the market that we forgot to take a break, playing for almost two hours straight! That place feels like home. January 9, 2012. We performed at the AcoustiCafe open mic last night at Club Cafe on the Southside. What a blast! The audience was extremely receptive and the quality of the performers was excellent. Organizer Mark Willson and host Jimbo Jackson (of Jimbo and the Soup Bones) did a great job, setting a warm, welcoming tone and keeping things moving. We're looking forward to going back. FYI, AcoustiCafe happens every Monday night and there's no cover charge. December 28, 2011. We performed a free lunch time concert at the Broadway Market in Buffalo, NY today. Among our audience members were vendors, shoppers, folks enjoying a respite from the cold, and our friend Kevin, upright bass player extraordinaire from the Buffalo-based Gypsy Jazz band, Babik. Several friendly people approached us to introduce themselves, including a bus driver who said he often spends his lunch hour enjoying live music at the market. December 27, 2011. When we arrived at Kikko's Koffee House and found a parking spot reserved for "Rockstars," we knew we were in for an evening of fun. One of the owners, Tom, took a particular liking to our song, "Insane when we're apart," and a couple smooched during our debut of "Something awful," which we took as the highest form of compliment. Feeling at ease in the beautifully decorated restaurant, which opened last year, we took a chance and introduced "Omaha," another original, which features mandolin, a new instrument for our duo. Gary's mother, father, and brother, all of whom were there, said the venue was much more upscale than the kinds of places they'd seen him perform in before. December 22, 2011. We are so grateful for the presenters who made it possible for us to share our music this year: Three Rivers Arts Festival, Pittsburgh International Children's Festival, A Fair in the Park, Calliope, SLB Radio, Pittsburgh Public Market, Community Heritage Market at the Pump House, Broadway Market, North East Regional Folk Alliance, Pittsburgh Parks Conservancy, East End Food Co-Op, University of Pittsburgh, Squirrel Hill Urban Coalition, Carnegie Library of Pittsburgh, Todd's Musical Petting Zoo, Cafe dez Artz, Kikko's Koffee House, Mendelson Gallery, Eve Goodman, First Unitarian Church of Pittsburgh, Forward Shady Apartments, and Riverview Towers Apartments. December 10, 2011. We thoroughly enjoyed our road trip to Todd’s Musical Petting Zoo this weekend, about 100 miles from Pittsburgh in a town called North East, PA. We were touched by the generosity and good-naturedness of “Zookeeper” Todd Crowley who arranged a concert for us followed by a jam with him and other local musicians, and then put us up for the night in his beautifully restored 100+ year old apartment. Todd travels with his impressive collection of instruments to music festivals across the US and Canada, giving children and adults a chance to connect with the folk tradition. December 8, 2011. We had the privilege of opening for Eve Goodman and John Caldwell (accompanied by Jim diSpirito on percussion and Dave Pellow on bass) at the Square Cafe in Regent Square this evening. The place was filled with friendly folks enjoying the music, food, and each others' company. November 30, 2011. We performed today for a large, receptive crowd at Riverview Towers, an apartment complex for independent senior citizens in Squirrel Hill. A few folks sang along, many clapped their hands or tapped their toes, and one man got up and danced. His dancing was so inspired we couldn't help but grin... even when we were singing the blues! November 14, 2011. We joined 800+ musicians, presenters, promoters, and other die hards at the annual conference of the Northeast Regional Folk Alliance (NERFA) in Kerhonkson, NY this past weekend. Interesting workshops, concerts by talented performers, and impromptu jam sessions made for a very stimulating experience. One of our audio recordings received favorable reviews from a panel of experts, which was a thrill. We also enjoyed hanging out with other Pittsburghers (Brenda Jean, Brad Yoder, Jason Rafalak, Jay Hitt, Ken Batista, Mark and Linda Holsing) and meeting a duo just like us from Connecticut (Brooker & Bullen). October 23, 2011. We performed again at the Pittsburgh Public Market, one of our favorite venues. Jenny was battling laryngitis so Gary handled most of the singing. His rendition of Paul Simon's "Me and Julio" -- featuring mouth trumpet during the instrumental break -- was particularly well received. October 6, 2011. We were honored to provide entertainment for the Squirrel Hill Urban Coalition's Farmers' Market today. Highlights for us included a visit from Murray the Squirrel, the coalition's cute, oversized mascot; and lively dancing by good friends who stopped by. The sounds of city buses and car horns made us feel right at home but also caused us to strain our voices a bit. Well worth it, of course. We enjoyed watching passersby mouthing lyrics and bouncing to our beat. September 25, 2011. We performed at the 6th Annual East End Food Co-op Art Harvest this afternoon, a popular event featuring food, art, crafts and live music. We often crack ourselves up but today we managed to elicit a few chuckles from the audience by inserting venue-appropriate references to "organic," "bulk," and "free range" during our rendition of "Diddy wa diddy," an old Arthur Blake classic. Our friend, Brian Junker, ran the sound board which was a treat for us. We get together regularly with him and another pal, Jeanne Herbert, to play music. September 11, 2011. 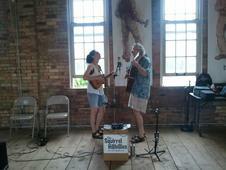 We returned to the Community Heritage Market at the Pump House for an afternoon of live music. It was a great chance to pull out some songs we hadn't done for a while, along with all the new stuff. One vendor was so impressed with Gary's fine guitar playing that she sent him home with a big bag of homegrown tomatoes. September 11, 2011. We opened a day of live music at the 42nd Annual "A Fair in the Park," a contemporary crafts and art show and sale presented by the Manchester Craftsmen's Guild and Citiparks at the Pittsburgh Center for the Arts. The next act wasn't there when we wrapped up our 45-minute set so we were instructed to keep playing. It was the first time we've ever been asked for an encore by the guy running the sound system! September 10, 2011. We spent the morning with Larry Berger, host of "Live on Eleven," a weekly public radio program produced by Saturday Light Brigade. It was a thrill to share our music with 60,000 listeners across the region. 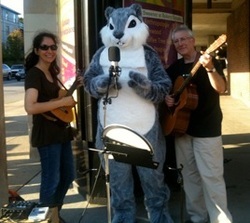 A recording of the entire show is available online at neighborhoodvoices.org/live-music-the-squirrel-hillbillies. September 9, 2011. We kicked off a performance-filled weekend with a lunchtime concert at Schenley Plaza. Our 90-minute set included two new Squirrel Hillbillies originals: "Strange life," a ballad that contains a reference to Kurt Vonnegut; and "Insane when we're apart," a blues song we just finished writing yesterday. Photo by Ken J. Arnstein Jr.
August 19, 2011. Thunderstorms knocked out power across the city this morning but the Squirrel Hillbillies were not deterred. Having already rescheduled once because of a heat advisory, we were determined to present the Schenley Plaza concert sponsored by the Pittsburgh Parks Conservancy. Our 90-minute acoustic set included the debut of "Fat cat skinny cat," an original song celebrating feline diversity. August 7, 2011. We provided live entertainment for two hours at the new Community Heritage Market at the Pump House at the Waterfront. We were delighted by the comfort and beauty of the historic landmark, and enjoyed chatting with a volunteer from the nearby Carnegie Library of Homestead and vendors selling handmade soaps, candles, crafts, baked goods, and iced tea. July 29, 2011. We returned to the Pittsburgh Public Market for a lunchtime concert today. Our acoustic set of folk, country and blues included the debut of "When I'm gone," a Squirrel Hillbillies original with quirky lyrics that incorporate a syllabically challenging reference to Patchouli. July 18, 2011. We performed for a very pleasant audience assembled in the comfortable lobby of the Forward Shady Apartments in Squirrel Hill today. Before the show, a resident approached us to inquire about a favorite song of hers which, naturally, Gary knew, and the two of them proceeded to sing it together while he accompanied on guitar. July 11, 2011. We performed a free family concert at the Squirrel Hill branch of the Carnegie Library of Pittsburgh this evening. We had hoped to be out in the courtyard but ended up inside because of bad weather. Our audience was lively, even raucous at times. Toddlers sure do know how to have a good time! June 15, 2011. We made a special appearance at Bill Ballon Automotive in Lawrenceville today to serenade the mechanic who procured and installed a new engine in Gary's car when his engine went missing, the inspiration for our original song, "Engine Blues." June 10, 2011. We performed this afternoon at the Three Rivers Arts Festival in downtown Pittsburgh, running the mic, mixer and speaker off a big, bright orange battery. Listeners expressed pleasure, including one man who described the music as "entirely enjoyable." With perfect timing (and/or considerable luck), we ended our 90-minute set and packed up all the equipment just moments before a torrential downpour began. June 3, 2011. We returned to Schenley Plaza for another free lunchtime concert on a beautiful spring day. Our two-hour set included several freshly arranged songs, one of which served the dual purpose of entertainment and music therapy, taking us outside our respective comfort zones to explore new musical permutations. May 23, 2011. We provided a "musical prelude" for a community meeting sponsored by the Pittsburgh Parks Conservancy to involve the public in improving the Panther Hollow Watershed. The performance and meeting took place under the tent in Schenley Plaza. May 12, 2011. We performed at the 25th Annual Pittsburgh International Children's Festival, a five-day event featuring music, theater, dance, and more. In addition to singing along and bouncing in their seats, audience members were invited to try using brushes on Jenny's portable snare drum and plucking the strings on her ukulele. May 6, 2011. We returned to Schenley Plaza for another lunchtime concert, joined this time by guest artist Brenda Jean, whose powerful, expressive vocals infused energy into the set. We amused ourselves by trading instruments for a couple of songs, a gimmick we refer to as "the switcheroo." April 8, 2011. The Pittsburgh Public Market was hopping today with students visiting from Maryland, members of a professional networking group, and other folks who came to check out the fresh produce, prepared foods, and crafts. We performed for more than two hours, taking a few short breaks to chat with audience members and pose for photos. After the show, the folks representing Clarion River Organics, a cooperative of ten family farms, generously offered us free rutabagas, the root vegetable featured in our original song, "No bone." March 25, 2011. We returned to the Pittsburgh Public Market for another lunch time concert. After the show, we chatted with Manager Cindy Cassell who was instrumental in launching the market last summer. March 19, 2011. We spent a lovely afternoon at the Mendelson Gallery in Shadyside, providing live music for an art opening by friend Terry Shutko. Seated near the window, with the sun streaming in, and surrounded by beautiful paintings, sculptures and other aesthetically pleasing objects, we thoroughly enjoyed the experience. February 27, 2011. We performed for a full house at the Cafe Dez Artz in Swissvale. Our set included "Bluebird" by Emily Pinkerton, a talented singer-songwriter who was in attendance, along with two dozen other originals and covers featuring guitar, ukulele, snare drum and vocal harmonies. A free will donation yielded $85 for the Carnegie Library of Pittsburgh, one of our favorite local amenities. February 13, 2011. We performed for two hours at the Pittsburgh Public Market which was full of shoppers enjoying a Saturday in the Strip District. Several friends and family members stopped by, including a couple of jazz musicians from NYC, and some children provided vocal support on a few songs. January 28, 2011. We returned to the Pittsburgh Public Market for another free lunchtime concert, this time tying into the PA system so our music could be heard throughout the building. After performing, we chatted with farmers, chefs, artists, and other merchants who come from as far as 50 miles away to sell their goods every week. January 14, 2011. We performed an hour-long concert through Calliope's "Emerging Legends" series at the Cup & Chaucer Cafe inside the University of Pittsburgh's Hillman Library. The highlight was when the audience joined in – with some encouragement – on "Diddie wa diddie," an old Arthur Blake classic. January 9, 2011. We presented music during Sunday morning worship services at the First Unitarian Church of Pittsburgh. Selections included an original instrumental tune arranged for two ukes, an original song conceived of while composting, and two covers requiring alternate guitar tunings. December 22, 2010. We entertained vendors and patrons of the Pittsburgh Public Market in the old Produce Terminal Building on Smallman Street in the Strip District. In addition to a selection of interesting cover songs, many of which featured food, the two-hour set included world premieres of two Squirrel Hillbillies originals: "No Bone" about a man trying to feed his hungry children; and "Engine Blues" about an essential car part gone missing. November 19, 2010. We performed for a large, enthusiastic audience at the Carriage House Children's Center. We also visited several classrooms for a musical "show and share." While the children enjoyed strumming and plucking the strings on both instruments, what really captured their attention was the "blue screen" (digital tuner) clipped to the head of the uke. October 28, 2010. We entertained neighbors along with visitors from the suburbs and other far off places at the first annual Squirrel Hill Harvest Festival sponsored by the Squirrel Hill Urban Coalition. September 24, 2010. We hauled musical instruments, sound equipment and furniture in a borrowed Subaru and entertained a lunchtime crowd under the tent in Schenley Plaza in Oakland with 90 minutes of acoustic folk, country and blues from a stage set up for other musicians to use in an evening concert. September 22, 2010. Tired of being mistaken for tax accountants, we've changed our duo's name from "Bain & Crouth" to the "Squirrel Hillbillies." Our new name, which pays homage to the hip neighborhood in Pittsburgh's East End, reflects our urban, unconventional approach to life and our unique perspective on what's in style. September 19, 2010. We performed 90 minutes of acoustic folk, country and blues on the front lawn of a beautiful Victorian featured on the Friendship House Tour, a popular annual community fundraiser. July 31, 2010. We performed again at the Mt. Washington Art Marketplace, a weekly event featuring visual artists from across the region. The beautiful weather, attractive cityscape and friendly passersby made for a lovely afternoon. June 19, 2010. 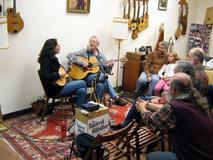 We performed two hours of traditional and contemporary folk and blues at the Mt. Washington Arts Marketplace, a weekly outdoor event featuring local artists. Shaded by trees and with a spectacular view of "the Point" outlined by Pittsburgh's three rivers, we enjoyed entertaining passersby, many of whom arrived via the Mon Incline. May 15, 2010. We entertained scores of passersby for two consecutive days at the Pittsburgh International Children's Festival. May 8, 2010. Debuting as a duo, we performed a 45-minute set of traditional and contemporary folk music, including several children's songs, at the Friendship Flower and Folk Festival in the East End of Pittsburgh. .For more recent posts, see Blog or Blog Archive (2013-2015).